Thomas L. Jennings (1791–1856) was the first African-American to be granted a patent, 3 March 1821 (U.S. patent 3306x). In his early 20’s he became a tailor but then opened a dry cleaning business in New York City. 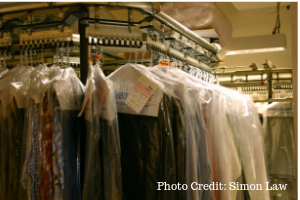 While running his business, Jennings developed “dry-scouring” and patented the process which would go on to make modern-day dry cleaning possible. The patent to Jennings generated considerable controversy during this period. Slaves at this time could not patent their own inventions. This regulation dated back to the U.S. patent laws of 1793. The regulation was based on the legal presumption that “the master is the owner of the fruits of the labor of the slave both manual and intellectual.” Thomas Jennings, however, was born a free man and thus was able to gain exclusive rights to his invention and profit from it. In 1861 patent rights were finally extended to slaves, 5 years after Jennings’ death.